The Saxifragaceae are a small family of about 30 genera of herbaceous plants found in the temperate zones of the world (more in the Northern Hemisphere than the Southern - image of Saxifraga oppositifolia from Wikipedia). Many species are found in alpine or arctic habitats. The flowers have a corolla of five separate petals and five conjoined sepals and are often borne in a raceme, while the fruit is generally a dry capsule. Classification of the Saxifragaceae is a point fraught with difficulty. The brief description I've given applies to what was the subfamily Saxifragoideae, to which phylogenetic studies indicate the family should probably be restricted (Soltis & Soltis, 1997). Saxifragaceae sensu stricto is then placed in a small order Saxifragales with families such as Crassulaceae, Paeonia and Grossulariaceae. 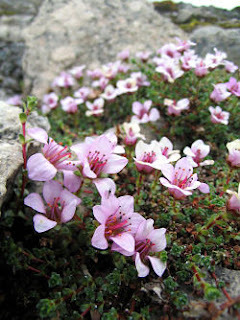 Crassulaceae and Saxifragaceae have both been regarded in the past as members of the subclass Rosidae, and it seems likely that Saxifragales are basal rosids, but other published phylogenies show a little uncertainty about their exact position relative to the rosid-asterid split (for instance, Kårehed  shows Saxifragales as sister to Caryophyllales + Asteridae rather than to Rosidae, but taxon sampling was very low). Other taxa previously included in Saxifragaceae have been scattered to the winds, settling in a whole range of places within the angiosperm family tree. Most notably, a collection of past saxifragaceans has staked out a position low in the asterid tree as the family Hydrangeaceae. Hydrangeaceae will probably be most familiar as the family including the hydrangeas widely grown as ornamentals (and going by what I've heard people saying, seemingly a real love-them-or-hate-them kind of plant). 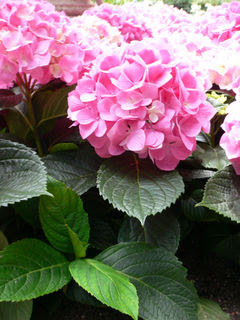 I was always impressed by the story that flower colour in hydrangeas is determined by soil pH - plants in acidic soil produce blue flowers, while alkaline soils give rise to pink flowers. I had intended to write this post on the genus Broussaisia in Saxifragaceae, but in looking up information for the post I soon discovered that Broussaisia is no longer a saxifragacean as it was listed in Yampolsky & Yampolsky (1922), but a member of Hydrangeaceae. In fact, phylogenetic analysis indicates that Broussaisia (including a single species of Hawaiian shrub, B. arguta, commonly known as the kanawao) is nested within the genus Hydrangea (Hufford et al., 2001). 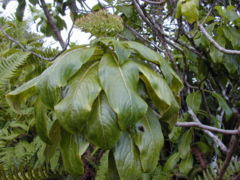 The kanawao (shown above in an image from Wikipedia) is found on all the main islands of Hawaii, and is quite unusual for Hydrangeaceae in producing a fleshy (albeit small) fruit. Go to lemmingreport for an interesting page collecting old reports on the use of kanawao in traditional medicine - apparently the fruit could be used to "bring about conception with a barren woman". The efficacy of this remedy was such that apparently one could vary the dose to determine whether the child was a boy or a girl... However, the supreme money quote has to be: "It was the way of increasing the population in Hawaii during the old days. ... Look at how the numbers of Japanese, Chinese and Filipinos have increased in immigrating in Hawaii. They are not good at settling, but they do take care and know how to increase their numbers". Hufford, L., M. L. Moody & D. E. Soltis. 2001. A phylogenetic analysis of Hydrangeaceae based on sequences of the plastid gene matK and their combination with rbcL and morphological data. International Journal of Plant Sciences 162 (4): 835-846. Kårehed, J. 2001. Multiple origin of the tropical forest tree family Icacinaceae. American Journal of Botany 88 (12): 2259-2274. Soltis, D. E., & P. S. Soltis. 1997. Phylogenetic relationships in Saxifragaceae sensu lato: a comparison of topologies based on 18S rDNA and rbcL sequences. American Journal of Botany 84 (4): 504-522.